Sheila mostly operates out of the limelight: she doesn’t have a huge social media presence and she’s not all that likely to show up on panels at conventions. But behind the scenes she does amazing work with writers, helping them make their stories the best they can make them. In fact, the day after she won the Hugo, she met with me to discuss my next science fiction novel for DAW Books, The Cityborn, coming out next July. There’s no doubt that the revisions I’ll make in response to her suggestions will make the book stronger and better. 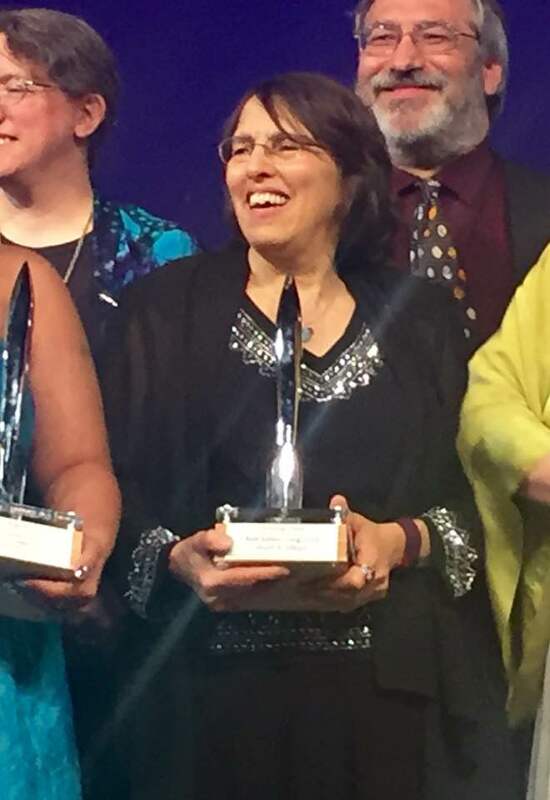 So way to go, Sheila! Nobody deserves it more. She also gave the best acceptance speech of the evening, which you can watch on YouTube. 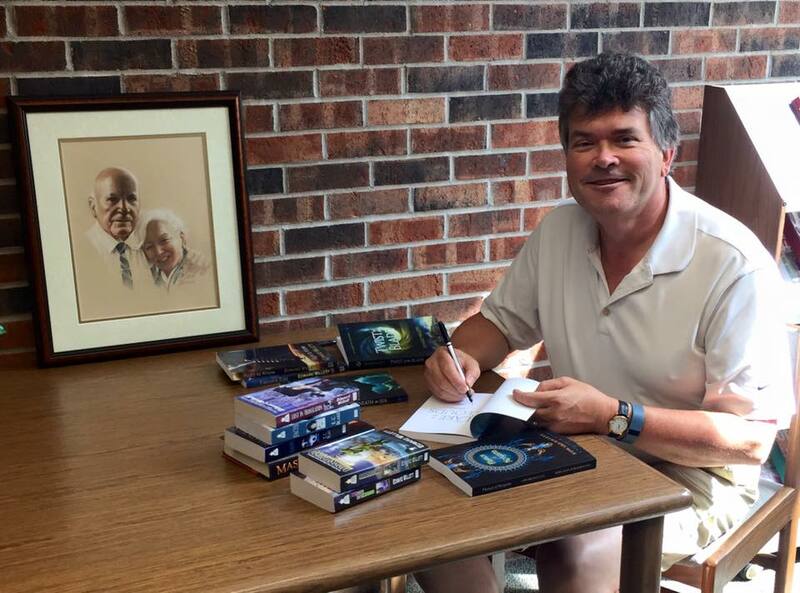 WorldCon in Kansas City was great from my point of view. I was on four good panels talking about YA fiction (I think my favorite was the one about “Latchkey Kids,” i.e., why do we get rid of the parents so often in YA books? ), met some fascinating people, and really enjoyed the panels I attended, which were mostly science-focused rather than science fiction focused. (A Q & A with astronaut Stan Love was particularly enjoyable). After Kansas City, we went down to Adrian, Missouri, a small town about an hour south of there, and stayed on my cousin’s farm for a couple of days. While there we made a pilgrimage into the slightly larger town of Butler, Missouri, where my mother (and next-oldest brother) were born, but which is also notable in science fiction circles for being the birthplace of Robert A. Heinlein, way back in 1907. Since my daughter enjoys Heinlein (i must be doing something right) I made sure to get a picture of her in front of his birthplace. Really just an ordinary house, but at least it’s still there! There used to be a nice sign out front on two posts; currently it’s leaning discretely against the house. Then we paid a visit to the Butler Public Library, which has a wing and reading room built with money donated by the Heinlein estate (specifically by his widow, Virginia Heinlein). There are several early and collectors’ editions of his books there, and the librarian had just come back from Jefferson City, where a bronze bust of Heinlein, to be displayed in the Capitol Building, had just been unveiled as he was inducted into the Hall of Famous Missourians. I found out they had none of my books, and they’re completely self-funded, i decided I could remedy that, and expand their collection a little bit, by donating as many books as I could from those I’d taken down there with me. Which is what I’m doing in the photo . They were really happy to get the books and I was very happy to give something back (or, as Heinlein would put it, “pay forward”) to a library in a town with a family connection…and one with a connection to Heinlein, one of my favorite writers growing up and a huge influence on my becoming a science fiction writer. Before we headed south to Kansas City, we were in Calgary for When Words Collide (I posted my busy schedule for that last time). it went really well, as well; it continues to be my favorite writing conference every year, and I strongly urge you to try to get there if you are interested in writing or books. 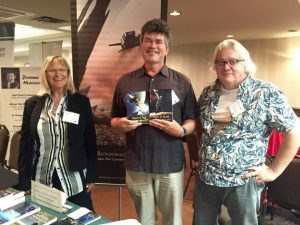 One more photo, of me with Liz and Hayden Trenholm of Bundoran Press, publisher of my Peregrine Rising duology, Right to Know and Falcon’s Egg. 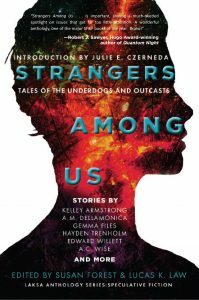 My last event at When Words Collide was also one of the best: the launch of Strangers Among Us, the new anthology from Laksa Media that includes my story “I Count the Lights.” This themed anthology approaches mental illness from a speculative fiction angle, and the publisher is making a donation to the Canadian Mental Health Association from the proceeds. 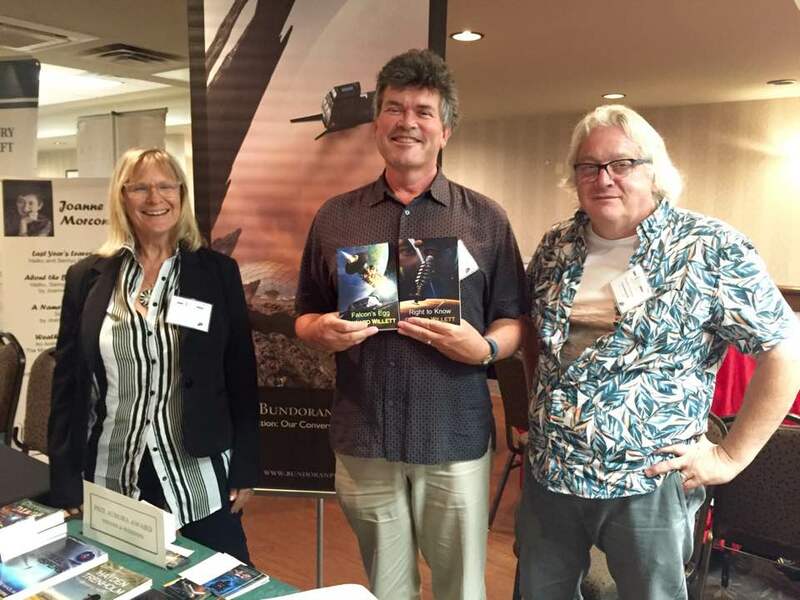 The launch was emceed by my fellow DAW author Julie Czerneda, who also wrote the introduction. Rather than try to have the attending authors read anything (there wasn’t time with that many authors) she instead had us talk a little bit about the inspiration for the stories. Many of the authors had a family or personal connection to mental health issues: it was actually very moving. And someone told me how much they loved my story, which was great to hear. There are many great writers and great stories in the anthology: check it out! Reviews have been very positive.